The Harry Potter franchise continues to expand its scope in David Yates’ Fantastic Beasts: The Crimes of Grindelwald. Fantastic Beasts and Where to Find Them wasn’t a bad film by any stretch. It was a little sloppy and unfocused but overall it had a great deal of potential. The Harry Potter franchise has infinite scope for interesting stories to be told and there’s a real sense of how that potential could be used in that film. This instalment sort of continues along those lines but completely drops the ball in almost every respect. It’s hard to describe the plot of this film because there really isn’t one. 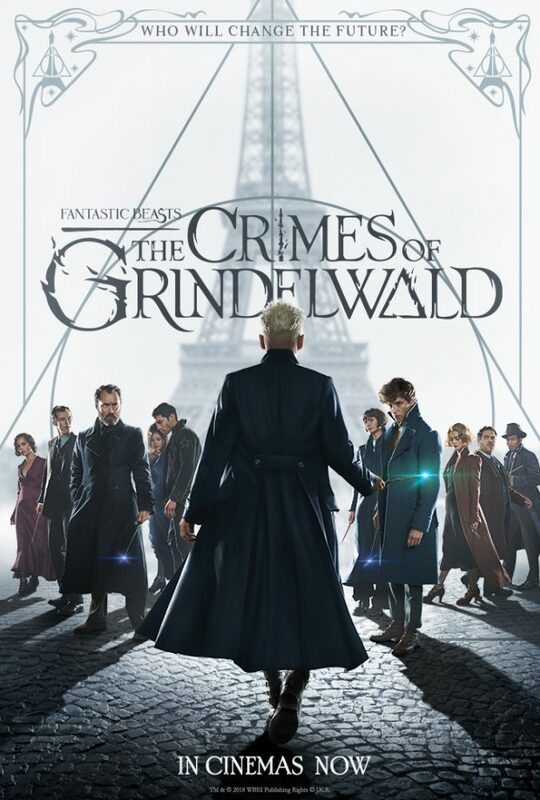 The title is incredibly misleading because it isn’t actually about the “Fantastic Beasts” or The Crimes of Grindelwald”. Both are part of the overstuffed and unfocussed narrative but never come into their own. The “Fantastic Beasts” side comes into play periodically by way of set pieces where Eddie Redmayne’s Newt Scamander comes up against some form of magical creature. These function as asides rather than being important to whatever the overall narrative is trying to be. It does supposedly revolve around Credence Barebone (Ezra Miller) who is wanted by various factions because he apparently has some importance to the Wizarding Community that is shrouded in mystery until towards the end of the film. As with most characters the script fails to give Credence the opportunity to stand out so by the time what makes him important is revealed there is no real interest in what that means. It also basically means that this film exits as an overly long setup for the next film. Grindelwald (Johnny Depp) is barely a presence in the film at all. His screen time is scarce and Depp’s performance fails to give him any sort of presence which is unacceptable considering this film is supposed to be about him. His importance to the narrative is reinforced here and there by characters referring to him as a reminder of how dangerous he apparently is but there’s no visual evidence of that at any point. The film’s climax removes him completely and replaces him with a special effect that various characters have to fight. It’s bizarre and laughable to behold. There is some backstory involving Grindelwald that occasionally threatens to be important but never actually comes to anything. He has a prior connection to Dumbeldore (Jude Law) that only serves as an excuse to prevent Dumbeldore from fighting him and solving the problem. The promise of a prior relationship between these two characters is interesting in theory but they never interact so it becomes another thing that is talked about and never pays off. Jude Law’s Dumbeldore could be interesting but he appears far too infrequently to make a significant impact. His lack of respect for authority and greater understanding of what is really going on are aspects of the character that fans will recognise and Jude Law’s performance suggests a reckless nature with a firm grasp on what he considers the right thing but restricting his appearance to a few scenes that are ultimately inconsequential makes his presence feel like empty fan service rather than being instrumental to what this film has to offer. A major issue this film has is that it’s unnecessarily bogged down in backstory preventing an actual plot from emerging. The structure of the film is that characters move between locations before stopping completely to deliver an exposition dump of their troubled past that proves to be ultimately meaningless. Newt’s history with Leta Letrange (Zoë Kravitz) is the most interesting of these and tries to connect with what could laughably be called a plot but fails because the script isn’t quite sure what to say about these characters, their relationship or how it impacts the story that is trying to be told. Zoë Kravitz’ performance is really good despite what little she has to work with but there just isn’t enough there. Newt as a character hasn’t improved since the last film. He’s still largely uninteresting and has no discernible arc to follow despite being the main character. Anyone interested in seeing how his relationship with Tina (Katherine Waterston) has progressed will be disappointed by how the film explains what has happened between them since the previous film. Tina has very little to do here and enters the narrative too late to do anything of consequence. Dan Fogler’s Jacob Kowalski’s return is the definition of empty fan service with an explanation for his lack of memory loss that’s weak at best and frustrating at worst. His relationship with Queenie (Alison Sudol) is neither believable or interesting with a lack of any real development to either character that merits their inclusion in the film Queenie in particular develops along lines that make absolutely no sense given her established traits in the previous film and her behaviour in this one. The lack of focus on a specific narrative that carries the film and informs the actions of the characters is pretty much everything that’s wrong with franchise filmmaking these days. This is comparable to films like The Mummy because it also makes the error of assuming that world building works in place of actual story and exposition functions as progression of that narrative. I mentioned above that this feels like an overlong setup for the next film which makes this largely redundant as a viewing experience. Having characters move from place to place discussing various backstories while not doing much of anything isn’t interesting to watch and only serves to make everything more complicated than it needs to be. It’d be different if any of this was relevant to this film but almost none of it is. Some of it clearly exists to please long-time fans of the Harry Potter universe but for those less initiated all it does is deliver exposition about characters, places and situations that didn’t need to be explained. J.K. Rowling forgot to tell a coherent story in favour of dumping needless exposition on the viewer and the end result is a film that’s a turgid bore to watch. One positive thing that can be said is that the visuals are impressive enough though there is a dingy washed out aesthetic that makes some of it very difficult to make out. The design work on the French Ministry of Magic is a definite highlight and some of the creature designs are really creative. It’s just a pity the visual flair couldn’t be matched to a story that was in anyway satisfying. A turgid bore of a movie that is more concerned with detailing pointless backstories than telling a compelling story in its own right. There is no real story to latch onto, the titular Grindelwald barely appears which completely neuters any threat value he has as all characters do is talk about him and nothing all that interesting happens. The visuals are impressive enough and one or two characters stand out thanks to talented actors playing them but the lack of focus on anything and over reliance on unnecessary backstories are everything that’s wrong with franchise filmmaking.